In January and February, tax season is really tax refund season or tax money time! At M&M Tax, it is our goal to bring you the best tax money products and options every year. We know you want the Biggest & Fastest Refund allowed by the IRS. With our Easy Advance* (up to $6,000) and our “File Today, Pay Later” solution you’ll be glad you chose M&M Tax this year. 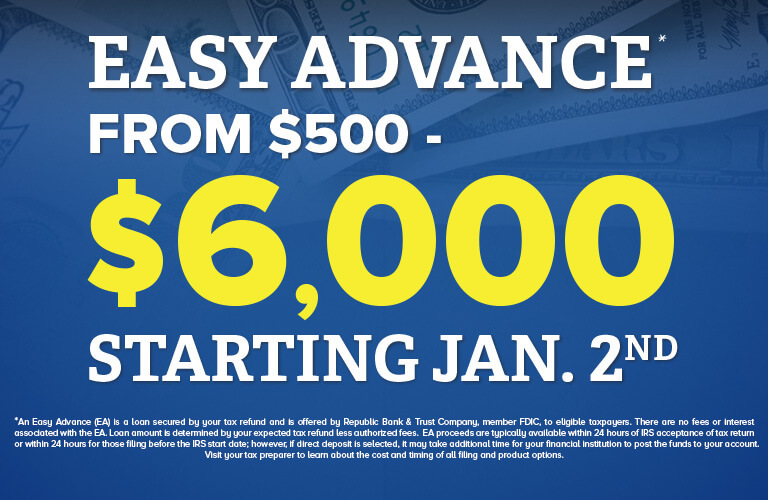 Beginning in January, you can get an instant tax refund advance up to $6,000 at M&M Tax Service. Yes that’s right; tax refund loans are available this year beginning January 2nd! With the IRS announcing they will be holding tax refunds of early tax return filers who have children until February 15th or later, you may need this money now. At M&M Income Tax Service you can file your tax return today and pay later. We call this our “File Today, Pay Later” option. How can we do this you ask? When you file your taxes, we can deduct your fees from your tax refund. When you select this “File Today, Pay Later” option, we don’t stop working on your behalf until your tax refund gets released by the IRS. When you choose our “File Today, Pay Later” option, not only do you get the peace of mind know that we don’t stop working on your behalf until your tax refund is released by the IRS, but you also get the option of how you want your tax refund disbursed to you. Select between the convenience of picking up a check at our tax office, a direct deposit into your checking account or a Visa prepaid card. If you choose to pick up your check at an M&M Tax office, you can take advantage of affordable and convenient check cashing options. Considerable resources have been invested in developing and maintaining these relationships over the years, so that you, our client, have the best available options to turn your check into cash.